Amano has grown approximately 2 times over a period of 20 years. This indicates that Amano has sustained steady growth over a long term. Looking at Amano's financial results of 20 years ago (FY1996), sales were approximately 54 billion yen and our operating profit approximately 6.1 billion yen. In contrast, our sales for FY2018 were approximately 131.7 billion yen and our operating profit approximately 15.1 billion yen. This indicates that we have grown roughly 2 times in terms of both sales and operating profit. 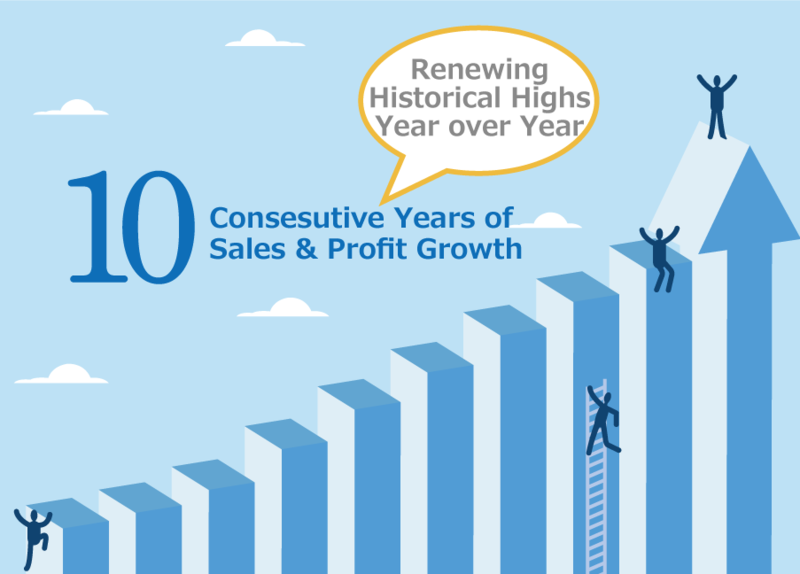 Although sales declined in FY2009 due to the effects of the so called "Lehman Shock", since then we have achieved sales and profit growth for 9 consecutive years. As of FY2018, our consolidated number of employees increased to approximately 5,200 from approximately 2,600 in FY1999. We have established group companies in Japan and abroad in order to continue the provision of high-quality services and innovative products. Our organization is also evolving as we grow. The most important aspect of our current growth is our overseas growth. In 1964, we established our first local subsidiary in the United States when we opened an office on Fifth Avenue in the middle of New York. We started our overseas business development more than half a century ago, but in recent years, we have accelerated our overseas growth by establishing local subsidiaries and manufacturing facilities as well as through M&As. Acquired Terry McGann & Associates, Inc. So, what is behind Amano's growth? What differentiates Amano from its competitors? Next, we will take a closer look at Amano's "strengths".